The decision by nephrologists, renal dietitians, federal agencies, health care payers, large dialysis organizations, and the research community to embrace serum albumin as an important index of nutrition and clinical performance is based on numerous misconceptions. Patients with analbuminemia are not malnourished and individuals with simple malnutrition are rarely hypoalbuminemic. With the possible exception of kwashiorkor, a rare nutritional state, serum albumin is an unreliable marker of nutritional status. Furthermore, nutritional supplementation has not been clearly shown to raise levels of serum albumin. The use of serum albumin as a quality care index is also problematic. It has encouraged a reflexive reliance on expensive and unproven interventions such as dietary supplements and may lead to adverse selection of healthier patients by health care providers. The authors offer a rationale for considering albumin as a marker of illness rather than nutrition. Viewed in this manner, hypoalbuminemia may offer an opportunity to improve patient well-being by identifying and treating the underlying disorder. Kidney disease is closely associated with protein–calorie malnutrition. The World Health Organization defines malnutrition as “bad nourishment” characterized by “inadequate or excess intake of protein, energy, and micronutrients such as vitamins, and the frequent infections and disorders that result.”1 The definition implies that protein–calorie malnutrition (henceforth referred to as “malnutrition”) will improve when missing nutrients are provided. Serum albumin is the principal nutritional marker used to identify malnutrition in patients with chronic kidney disease (CKD). Through endorsements by nephrologists, renal dietitians, the research community, federal agencies, health care payers, and large dialysis organizations, it has also become a de facto index of clinical performance. 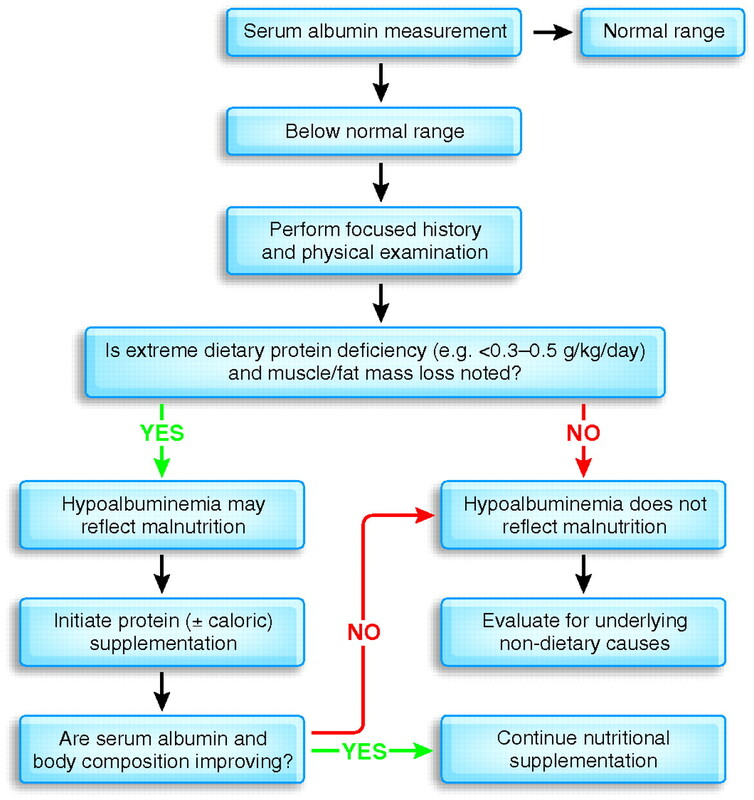 The use of serum albumin as a nutritional and quality care marker involves the following assumptions: Serum albumin is a reliable index of malnutrition; because serum albumin is typically low in patients with CKD, these patients should be considered malnourished; replacing missing nutrients will raise low albumin levels; and, because hypoalbuminemia is strongly associated with mortality, replacing missing nutrients to raise albumin will also improve patient outcomes. This review expands on previous viewpoints2 by critically examining these assumptions and offering an alternative vision to interpreting serum albumin. Albumin is a negatively charged, water-soluble protein (molecular weight 65 kD) that is synthesized in the liver. Its functions include maintaining osmotic pressure and transporting a variety of circulating molecules.3,4 Serum albumin levels are determined by rates of hepatic synthesis and secretion, exchanges between the intra- and extravascular compartments, lymphatic uptake, alterations in volume of distribution (including hemodilution), protein degradation, and body losses. The factors regulating serum albumin are similar between individuals with and without CKD. Reduction in the glomerular filtration rate does not, in and of itself, predispose to hypoalbuminemia. Individuals with hypoalbuminemia and advanced CKD have plasma albumin half-lives and degradation rates similar to those of healthy individuals16 and possibly even higher rates of albumin synthesis.17 Dialysis patients also show similar rates of albumin synthesis and turnover.17–19 However, conditions that often accompany CKD profoundly influence albumin synthesis. Among these are chronic metabolic acidosis20 and inflammation from concurrent illnesses.21 Therefore, apart from very rare circumstance in which dietary protein intake is minimal, hypoalbuminemia in CKD is driven primarily by nondietary factors. Is Serum Albumin a Useful Index of Malnutrition? Because glomerular hypofiltration does not directly influence albumin metabolism, it is instructive to consider clinical observations in populations without CKD to determine whether serum albumin is a reliable nutritional marker. Early findings in malnourished children from developing countries who manifest marasmus and kwashiorkor—two distinct states of malnutrition—offer important insights. Marasmus is characterized by severe loss of lean and fat mass resulting from prolonged deficiency of both calories and protein.22 Although individuals with marasmus typically manifest the skeletal appearance and apathetic, listless behavior indicative of starvation, their serum albumin levels remain normal.23 This key observation suggests that malnutrition, even when life threatening, is not sufficient to cause hypoalbuminemia. Kwashiorkor (a West African word meaning “the disease the child gets once the second one is born”) was originally described in Jamaican children by Cicely Williams.24 In many reports, the onset of kwashiorkor is linked to a diet extremely deficient or even absent in protein but adequate in carbohydrate-derived calories,22,24–26 whereas in others, it is associated with a variety of conditions, including inflammation.27–29 Its cardinal features include edema, dermatitis, and fatty liver in individuals who (despite their edema) are usually thin and underweight with spared subcutaneous fat stores.22,30,31 In contrast to marasmus, serum albumin levels are usually low.25,28,30,31 In fact, kwashiorkor is the only premoribund state of malnutrition in which serum albumin is low and is therefore the likely origin for the concept that serum albumin reflects nutritional status. This is a critical point, because kwashiorkor is often accompanied by infection and is rare in the Western industrialized world,32 where dietary protein is plentiful. In fact, the primary nutritional derangement in CKD nowadays is due to the consumption of excess calories and protein. The dialysis population's rising body mass index (BMI) levels exemplify this, with the mean now approaching the “obesity” range (BMI ≥30; Table 1). Additional insights are gleaned from the Minnesota Experiment.37 Initiated in the early 1940s by Ancel Keys, this seminal study explored the biology and physiology of human starvation. Thirty-two healthy young men complied with a semistarvation diet (3200 kcal/d baseline to <1600 kcal/d) over a 24-wk period. By study's end, the participants' generally emaciated appearance and altered behavior—including lassitude, weakness, and reduced cognition—reflected profound malnutrition. However, whereas the mean BMI and lean and fat mass all dropped sharply, serum albumin levels fell only modestly (Table 2). In fact, serum albumin poorly reflected nutritional changes within individuals, having increased in eight participants and remained unchanged in one, despite similar weight loss. Whether acute illness or extracellular volume expansion, which was commonly documented, played a role in the reduction of serum albumin in the remaining participants was not addressed. In a number of observational studies, including those enrolling hemodialysis study patients (Hemodialysis [HEMO] trial), Kaysen et al.42 determined that low serum albumin levels in dialysis patients are primarily associated with systemic inflammation, with little evidence implicating inadequate nutrition as a causative factor. Studies that did find a relationship between serum albumin and diet all used normalized protein catabolic rate to estimate protein intake43; however, normalized protein catabolic rate does not measure caloric consumption and has a number of other important limitations.44 Furthermore, the estimated amount of protein intake in all these studies far exceeds the amount typically associated with hypoalbuminemia. In summary, a plethora of corroborative clinical evidence in the general population and in patients with CKD demonstrates that serum albumin is an insensitive indicator of malnutrition, possibly excepting the very rare circumstance of kwashiorkor-like states, and that even severe protein and caloric restriction do not cause serum albumin levels to fall. Can Nutritional Interventions Raise Serum Albumin Levels? Although the assumption that hypoalbuminemia reflects a state of malnutrition is often accompanied by the corollary that nutritional interventions can raise serum albumin levels, the supportive evidence for this is inconsistent. Half of the handful of mostly unblinded, randomized studies testing the effects of oral nutritional supplements on serum albumin levels in dialysis patients found no statistical improvement, despite a susceptibility to bias favoring the study hypothesis (Table 3). The effect of nutritional supplementation on serum albumin and mortality has been tested only in the French Intradialytic Nutrition Evaluation study (FineS). Patients were randomly assigned for 1 yr to intradialytic parenteral nutrition versus no treatment, although both arms were prescribed oral supplements for 2 yr. Two-year mortality was the primary end point, and serum albumin was a secondary one.45 The intervention did not affect mortality rates, but serum albumin rose early in both groups (3.15 to 3.35 g/dl) and remained stable thereafter. Although the early rise in serum albumin may be construed as resulting from the nutritional intervention, a plausible alternative explanation involves the introduction of bias through the study's unblinded design that led to extranutritional interventions that reduced inflammation. In fact, study subjects' baseline characteristics more strongly suggest the presence of systemic inflammation rather than malnutrition, and early albumin changes were negatively correlated with changes in C-reactive protein (r = −0.47; P < 0.001). Therefore, on the basis of the available literature, there is insufficient evidence to conclude that nutritional supplementation raises serum albumin in CKD patients with hypoalbuminemia. Serum albumin is a commonly used research tool, being cited in more than one quarter of the scientific publications that include the terms “dialysis” and “nutrition.” Widespread hypoalbuminemia in the dialysis population in the United States has been used to support the concept that malnutrition is the preeminent nutritional concern46,47 despite evidence demonstrating that overnutrition, not malnutrition, now predominates (Table 1). Of note, the effect of excess adiposity on clinical outcomes remains controversial in CKD. Moreover, the severe degree of hypoalbuminemia, as noted in Table 1, is greatly out of proportion to what is observed in malnourished states and calls into question its use in establishing a link between malnutrition and inflammation. The National Kidney Foundation's Kidney Disease Outcomes Quality Initiative (K/DOQI) Clinical Practice Guidelines for Nutrition advanced the field by recommending that serum albumin be measured routinely in long-term dialysis patients but mistakenly used it as a nutritional biomarker.48 Data from the Minnesota Experiment was used as supportive evidence. The guidelines also focused on the inverse association between serum albumin and mortality and raised the possibility that nutritional interventions could improve mortality rates, while also acknowledging that inflammation could play a confounding role. The widespread use of serum albumin has led the US government to consider it as a quality care index. The Medicare ESRD Network Organizations Glossary suggests that albumin “may reflect the amount of protein intake in food.”51 In the Secretary of Health and Human Services 2004 Report to Congress on Medical Nutritional Therapy, serum albumin is reported as having “critical implications for dialysis patients if not carefully monitored.”49 The Centers for Medicare and Medicaid Services (CMS) End-Stage Renal Disease Quality Initiative offered incentive payments for reporting serum albumin as one of five quality measures52 but has since removed it.53 The CMS 2007 Annual Performance Report: ESRD Clinical Performance Measures Project chose albumin as a mortality risk indicator in adult dialysis patients and based its albumin goal on previous National Kidney Foundation guidelines.48 At least one large dialysis organization uses albumin as a quality indicator, and it may very well be adopted in the future by CMS and other payers to determine performance and influence value-based purchasing. The use of serum albumin by either payers or large dialysis organizations as a measurement of nutrition and performance is fraught with problems. Among these is the unsubstantiated premise that nutritional supplementation reverses hypoalbuminemia, leading to unnecessary and costly care. Another important issue is that despite the clinician's best efforts, the cause(s) of hypoalbuminemia may never be identified and may not be modifiable. The clinician may therefore be forced to select adversely, or “cherry pick,” his patient population to meet performance expectations. In addition, the index of performance for a particular clinician or dialysis facility may be falsely improved by the deaths of sicker patients who have lower albumin levels. Whereas the relationship between serum albumin and malnutrition is unreliable,2,54 the strong and robust inverse relationship between serum albumin and mortality does offer potential clinical value. The association was first described in 1990, when a serum albumin <4 g/dl was found to be inversely and progressively associated with increased risk for death in hemodialysis patients.55 Three years later, Owen et al.56 confirmed this observation. Although similar findings have subsequently been described in various populations with CKD, the relationship is highly unlikely to be causal, because even individuals who are born with a complete absence of circulating albumin (analbuminemia) manifest only minimal, if any, clinical symptoms.57 Moreover, acknowledging that an inverse association exists between albumin and mortality is one thing, but conflating it with death from a nutritional derangement is quite another. Nevertheless, hypoalbuminemia may help to identify the rare CKD patient with extremely low protein intake (<0.3 g/kg per d in predialysis patients with CKD or 0.5 g/kg per d as a conservative estimate in dialysis patients) who would be amenable to nutritional therapy. Figure 1 offers an algorithm to assist clinicians in identifying such patients. However, the lack of an effect of nutritional supplementation on serum albumin levels or anthropometric findings inconsistent with a kwashiorkor-like state (e.g. obesity) makes it very unlikely that hypoalbuminemia reflects a nutritional problem. Clinical algorithm for interpreting serum albumin is shown. Albumin's widespread use as a nutritional marker is understandable in light of the desire of clinicians for a convenient, widely applicable, easily interpretable, and accurate indicator of nutritional status. Unfortunately, no such indicator exists or probably will for the foreseeable future. This does not mean that serum albumin lacks utility. Although we have demonstrated that serum albumin is not a good nutritional index in the great majority of cases, it is a powerful way to detect underlying illness; that is, the higher the serum albumin, the more intact is overall health. All too often, the presence of hypoalbuminemia automatically triggers the initiation of nutrition supplementation and nothing more. This strategy may delay identification of an underlying treatable disorder. Although the causes of hypoalbuminemia are protean, it is important for the clinician at least to establish a differential diagnosis. Mitch et al.21 described a common pathway—the ubiquitin proteasome system—through which a number of CKD-related complications, including metabolic acidosis, reduced insulin action, higher angiotensin II levels, and inflammation, induce protein breakdown and muscle loss. The model of a common pathway is useful to consider when investigating hypoalbuminemia, especially in light of the established association between inflammation and albumin synthesis.42 An illness or inflammatory state can reduce serum albumin levels by suppressing synthesis, increasing catabolism and/or vascular permeability to albumin, or a combination of these. This article highlights the rationale for reconsidering albumin as a marker of illness rather than nutrition. Patients with analbuminemia are not malnourished, and individuals with simple malnutrition are rarely hypoalbuminemic. Furthermore, kwashiorkor, the only nutritional illness associated with hypoalbuminemia, is rarely observed in the United States and may itself be caused by underlying inflammatory conditions rather than malnutrition. Hence, the heavy reliance on serum albumin as a clinical and research nutritional tool in CKD is unwarranted, and the strategy of supplying expensive nutritional supplements as a reflexive first step in managing hypoalbuminemia should be discouraged. Nonetheless, the presence of hypoalbuminemia may offer health care providers the opportunity to improve patient well-being by identifying and treating underlying disorders. Because the cause of hypoalbuminemia cannot always be reversed or even identified, the use of serum albumin as a quality performance measure should focus only on whether it triggers a search for underlying causes rather than on the albumin level itself. A.N.F. is supported by the National Institutes of Health (K23 RR019615). We appreciate the data provided by the US Renal Data System.